The influence of Japanese ukiyo-e or “floating world” woodcut technique spread to Europe, the British Isles, and North America reasonably soon after the country’s opening in 1853. Printed images themselves became trade goods and eventually Japanese artists travelled outside their formerly sequestered nation. We are privileged to own prints by Yoshijiro Urushibara, who collaborated with Frank Brangwyn and John Edgar Platt who also profited from that exposure. The West Coast of the U. S., of course, was in a much more direct path of influence. Yet it was British artist Frank Morley Fletcher who brought the style to Santa Barbara, California. In 1924 Fletcher became director of the Santa Barbara School of the Arts and remained there until 1930. He then moved to Los Angeles and remained active until his death in 1949. 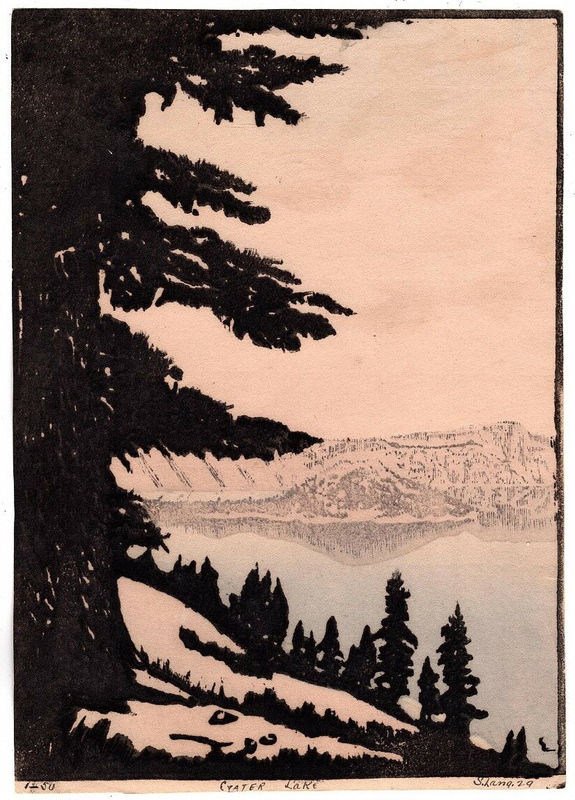 Our print “Crater Lake”, identified only by the date 1929 and the name S. Lang, was ostensibly created at the Santa Barbara studio of one S. Lang, where he or she was likely a student of Fletcher. On-line resources and even ancestry.com have failed to reveal any other information on the life and career of Lang. Mysteries like this are soluble. Yet there still remains the intriguing question of why the Community Collection boasts so many works directly and otherwise connected with Japan. By agincourtiowa in Landscapes & Livestock, Uncategorized on Sunday/10/February/2019 .